The black magnetic band for wrist with Tae Kwon Do grip is made of natural leather with a printed image. 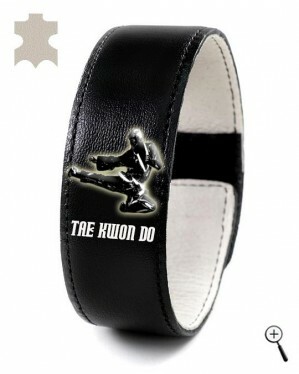 The leather of the bottom of the magnetic band for wrist absorbs sweat creating comfort in contact zone with the body. The lining of the magnetic band for wrist can be clean by gently rubbing with a soft cloth in lukewarm water.